EngageEngage across every customer touch points. Loyalty RewardsConvert customers to loyal customers. Product ReviewsTurn Trust Into Sales. Web Push NotificationReach Your Customer Without Email address. Email MarketingSmartify Your Email Marketing. Chat BotChat Bots – Don’t make your customers wait. Ai BoxConvert Any Store Into AI Enabled Smart Store. Reports and AnalyticsReveal & enrich granular customer insights. Customer SegmentationTarget your ideal audience at a glimpse. Customer TimelineCustomer Journey & Timeline From An Ai Perspective. 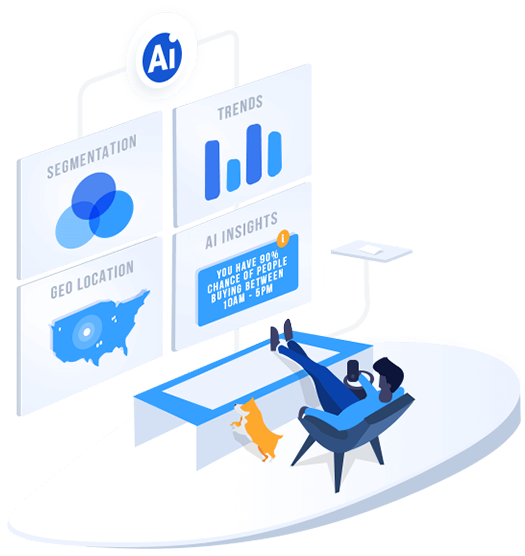 Artificial IntelligenceOptimise customer journeys with AI. PredictionsFind out your next customer. Product RecommendationsIn store Product Recommendations. Custom AudienceCustom audience created by AI engine. 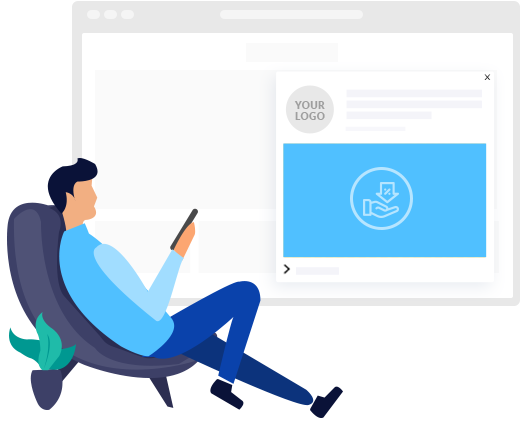 Capture More Ai powered Customers. Engage More With 8+ Automated Customer Touchpoints & Actionable Audiences. 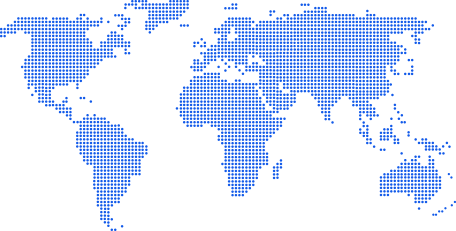 82,000+ Merchant Network Across 175+ Countries. 69M+ Online Buyers Ranked & Analyzed. Drive more engagement based on future projections rather than familiar-but-flawed intuition. Predicts when a customer is most likely to buy a product from the store. Predicts from which location most of the customers are likely to make a purchase. Predict chances of most people buying a product in a particular price range. Predicts who is most likely to purchase a product from your store again. 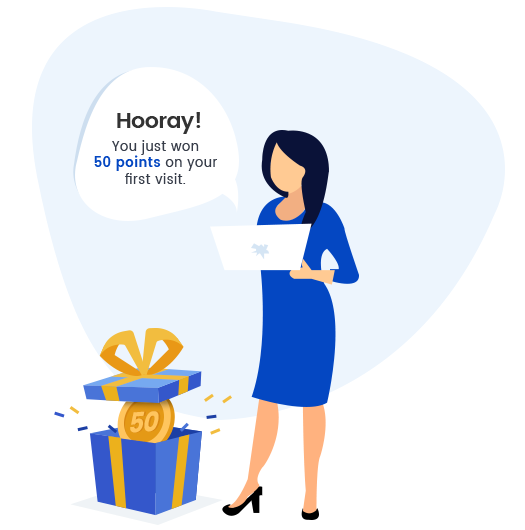 Track down your customers and automatically dedicate them extra loyalty points based on behavior and watch the sales skyrocket. Reward Points for Product Purchase, Signup, Writing Reviews, Referrals, on birthdays, etc. Let your loyal Customers bring new customers to your store through Referrals. Reward your loyal Customers for the points they have earned on your store. Customers will make more purchases in order to spend the reward points given. Best way to gain customer confidence is prominently displaying user-generated content like product reviews, testimonials, or even social media posts from your customers. Motivate customers by sending a review reminder after ‘X’ number of days. 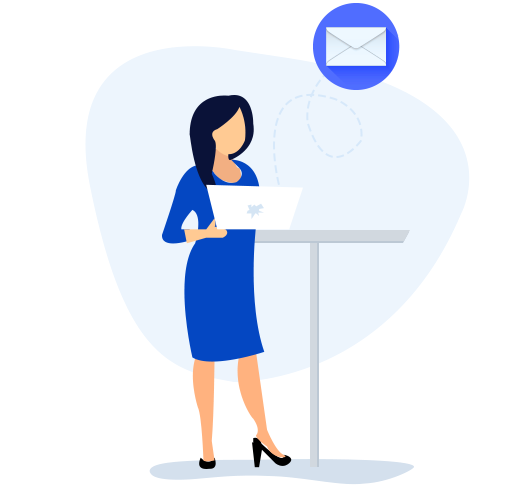 Collect more reviews, rating, and Q&A with artificially intelligent requests using our frictionless in-mail technology. Let your customers get quick and reliable answers from past buyers and your team. Encourage customers to write on-site reviews with customizable widgets. Bring your customers back to your store. Re-engage and turn them into revenue even after they’ve left your store. Track impression, clicks and push reach specifically for each campaign. Remind your customers about products left in carts and increase your sales. Based on user’s preferences, you can notify when out of stock products are available again. Notify users about price-drop on products in real-time, converting them to direct sales. Go beyond the tradition email marketing with automation. Send emails targeted to each contact’s interests. Email marketing automation takes care of details so you can focus on the stuff you love. Group your customers by location, age, and almost any behavior with advanced segmentation tools. Create campaigns. Send great emails to stay in front of your customers—and offer exactly what they want to see. You don’t need to be a tech wizard. Our drag-and-drop email designer lets you set up beautiful campaigns in minutes. Make your customer segments feel special by sending them messages which are specifically addressed to them & relevant to their interest. Target customers based on their past purchase history such as Top-purchasing customers. Segment customers based on different products purchased by them. Segment customers based on push reach, email sent, email opened, and much more. Segment customers based on the activities they perform on your store. Encourage visitors and customers to take actions with all in one Ai Box which is triggered by machine learning. 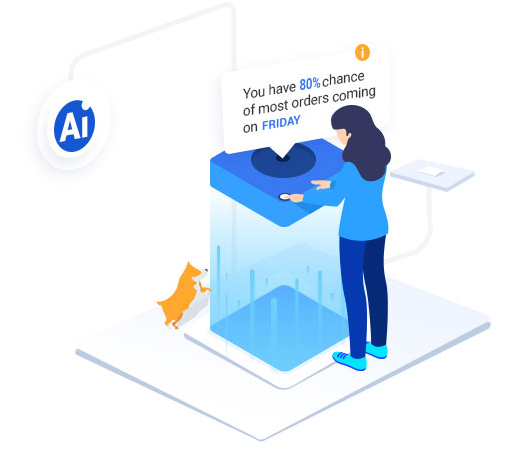 Engage & prompt your loyal customers through Ai Box. 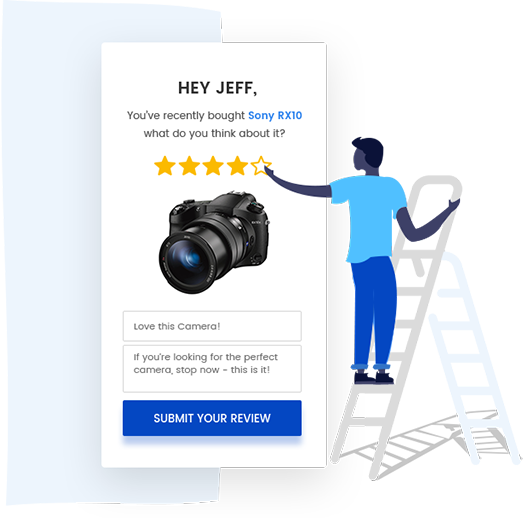 Collect more site & product reviews by placing it inside Ai Box. 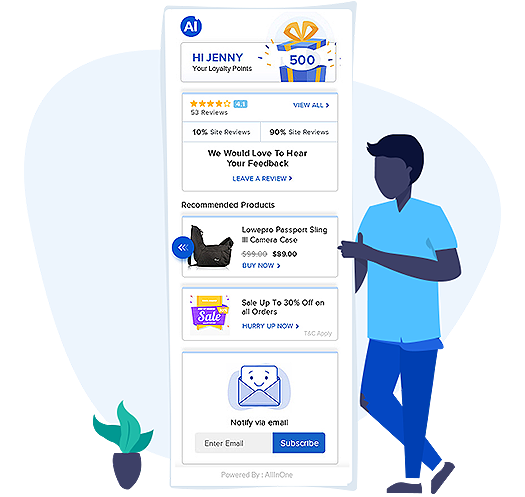 Send personalized offers directly from inside Ai Box based on customer activities. 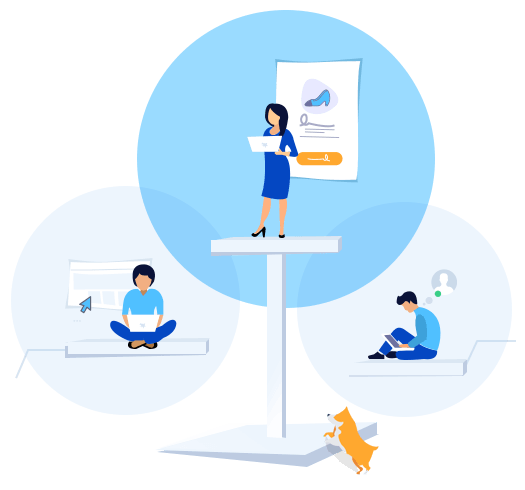 Get more emails subscribers through capturing their emails through Ai Box. Deeply understand your customers, and take intelligent actions to increase your customer adoption and retention. Individualize customer interactions by grouping them into different segments. Know about the viability and trendiness of all key products in the entire network. Filter your customers to display location-specific campaigns. Automatically analyzes, predicts, compares & enrich’s your customer experience. © Copyright 2019 - AiTrillion. All Rights Reserved. Designed By Gowebbaby.com.